One of our most exciting materials is hand moldable plastic. It is so exciting because customers use it to build prototypes and make parts quickly. In addition to speed, our customers do not need expensive tooling to make plastic parts. We are starting to see quite a few interesting projects and different techniques for hand moldable plastic. We plan to share the techniques and have plans to carry some of the tools and components that make it easier to work with. Today we interviewed Ryan Pinto from Toronto about how he designed and built the swivel joint pictured below for a baby gate. It took Ryan 3 attempts to get the part just right. He used his hands to form the part and the first two times ended up melting the part down and starting over. 1) I quickly get the hand moldable plastic into a simple 3D shape that best approximates the final model, in my case it was a cylinder. This is a smart LED that lets designers express their ideas in multicolor light without any knowledge of electronics. Its onboard firmware sets the ultrabright, wide-angle RGB LED to virtually any color and can make it blink in almost any sequence. It is programmable with simple color sequencing software or a programming interface. Once programmed, it can be treated like a standard LED in every other way. Because we sell so many different kinds of materials on Inventables we are starting to observe trends in the buying behavior of our customers. One trend we recently noticed has to do with the increasing use of LED's in product development. Most lighting in consumer products is moving towards LED because it does not burn hot and uses less power than traditional incandescent bulbs. There are two problems that designers run into with this transition and one of them is that the LED lights can appear dull or not as bright as traditional light bulbs. The other problem we've heard about is LED's tend to create a point light source rather than a smooth glow of light that is easy on the eyes. This afternoon we were working on a new feature and all of a sudden we noticed our traffic spiked. 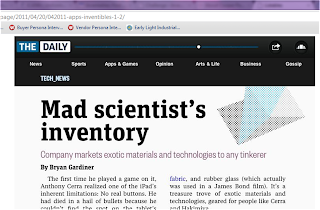 Typically when this happens we investigate to determine the source and discovered that the article Bryan Gardiner wrote about Inventables for the new iPad newspaper "The Daily" was just published. These days when a newspaper does an article about a company it is rare that the company would see a spike in their traffic because obviously you can't click on a traditional print newspaper and fewer young people subscribe to the newspaper. But had the added benefits of being interactive so they had a slideshow of our materials and could link out to our site and videos. Another brand new one on Inventables, this is a very open mesh rubbery feeling wire-like material. It can be creatively sewn, tacked or adhered as a decorative overlay for apparel, footwear, displays and other applications. If a picture is worth a thousand words a video is worth a million. At Inventables we are always working on making R&D inspiring and easy to do. Last year we launched the innovator's hardware store. Our goal over the next year is to build tools eliminate complexity from the process. Big companies have big budgets, experts, a network of suppliers, and equipment. We hope to be able to provide an online experience for everyone else that makes it just as easy for a small lean team to work on building a prototype. Ever wonder why some light fixtures are brighter than others with the same bulb? Some surfaces reflect light better than others. This light reflective film reflects 97% of the light that hits it. Inventables has just added this new material to our online store. It's got a cool embossed texture that provides a grippy quality.